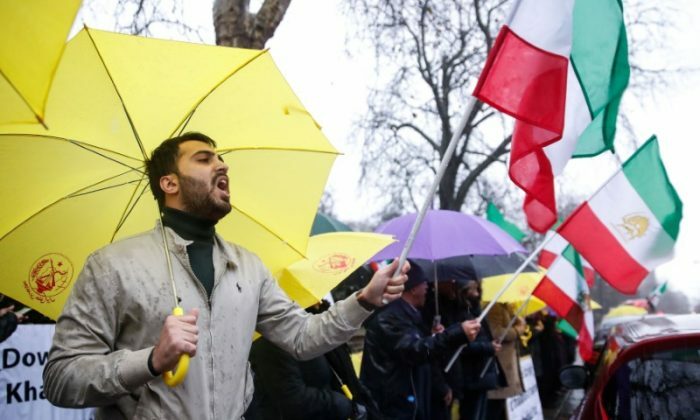 LONDON—Anti-government protesters demonstrated in Iran on Sunday in defiance of a warning by the authorities of a tough crackdown, extending for a fourth day one of the most audacious challenges to the clerical leadership since pro-reform unrest in 2009. Giving his first public reaction to the protests, President Hassan Rouhani appealed for calm, saying Iranians had the right to protest and criticize the authorities. Tens of thousands of people have protested across the country since Thursday against the Islamic Republic’s unelected clerical elite and government. Police in the center of Tehran fired water cannon to try to disperse demonstrators, according to pictures on social media. Demonstrations turned violent in Shahin Shahr in central Iran. Videos showed protesters attacking the police, turning over a car and setting it on fire. Reuters could not immediately verify the authenticity of the footage. There were also reports of demonstrations in the cities of Sanandaj and Kermanshah in western Iran as well as Chabahar in the southeast and Ilam and Izeh in the southwest. Demonstrators initially vented their anger over economic hardships and alleged corruption but they took on a rare political dimension, with a growing number of people calling on Supreme Leader Ayatollah Ali Khamenei to step down. Iranian security forces appear to have shown restraint to avoid an escalation of the crisis. Two people have been killed and hundreds arrested. The protests are the biggest since unrest in 2009 that followed the disputed re-election of then-President Mahmoud Ahmadinejad. Videos showed people in central Tehran chanting “Down with the dictator!”, in an apparent reference to Khamenei. Protesters in Khorramabad in western Iran shouted “Khamenei, shame on you, leave the country alone!”. The government said it would temporarily restrict access to the Telegram and Instagram messaging apps, state television quoted an informed source as saying. An Iranian reached by telephone, who asked not to be named, said there was a heavy presence of police and security forces in the heart of the capital. “I saw a few young men being arrested and put into police van. They don’t let anyone assemble,” he said. A video showed a protester being arrested by police while a crowd shouted “Police, go and arrest the thieves!” in the northwestern city of Khoy. Demonstrators also shouted: “Reza Shah, bless your soul.” Such calls are evidence of a deep level of anger and break a taboo. The king ruled Iran from 1925 to 1941 and his Pahlavi dynasty was overthrown in a revolution in 1979 by Ayatollah Ruhollah Khomeini, the Islamic Republic’s first leader. High prices, alleged corruption and mismanagement are fuelling the anger. Youth unemployment reached 28.8 percent this year. Economic indexes have improved under Rouhani’s government and the economy is no longer in dire straits. However, growth has been too slow for an overwhelmingly youthful population, far more interested in jobs and change than in the Islamist idealism and anti-Shah republicanism of the 1979 revolution. The demonstrations are particularly troublesome for Rouhani’s government because he was elected on a promise to guarantee rights to freedom of expression and assembly. His main achievement is a deal in 2015 with world powers that curbed Iran’s nuclear program in return for a lifting of most international sanctions. But it is yet to bring the economic benefits the government promised. Ali Asghar Naserbakht, deputy governor of Tehran province, was quoted as saying by ILNA news agency that 200 protesters had been arrested on Saturday. Tehran prosecutor Abbas Jafari Dolatabadi said some of those arrested had confessed “they were carried away by emotions and set fire to mosques and public buildings”, adding that they would face severe punishment. “After giving thousands of martyrs for the Revolution, the nation will not return to dark era of Pahlavi rule,” he said. Police and Revolutionary Guards have in the past crushed unrest violently. These protests could be worry authorities more because they seem spontaneous and lack a clear leader. And yet analysts say Iran’s leaders believe they can count on support from many of the generation that took part as youths in the 1979 revolution because of their ideological commitment and the economic gains they have made under the government. In apparent response to the protests, the government backed down on plans to raise fuel prices, promised to increase cash handouts to the poor and create more jobs in coming years. “We predict that at least 830,000 jobs will be created in the new year,” government spokesman Mohammad Baqer Nobakht said on state television on Saturday night. He gave no details. Around 3.2 million Iranians are jobless. Protesters also expressed anger over costly interventions in Syria and Iraq, where Iran is engaged in a proxy war for influence against regional rival Saudi Arabia. U.S. President Donald Trump and Republican lawmakers offered implicit support on Sunday to the protesters. “Big protests in Iran,” Trump said in a tweet. “The people are finally getting wise as to how their money and wealth is being stolen and squandered on terrorism.